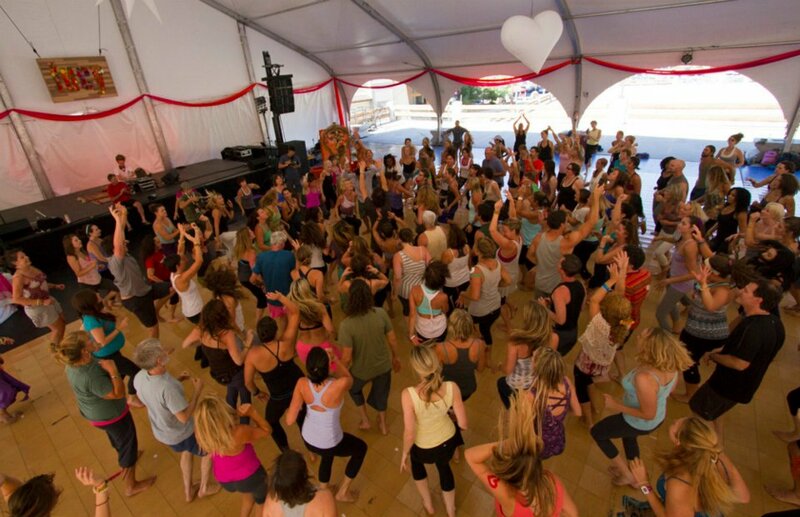 Wanderlust is a one-of-a-kind festival bringing together the world's leading yoga teachers, top musical acts and DJs, renowned speakers, top chefs and winemakers, and much, much more -- all in a setting of breathtaking natural beauty. We're talking about fun in the sun and dancing under the stars. Hiking on peaceful trails and gettin' your down dog on at the top of the mountain. Sipping poolside cocktails with your friends, and then enjoying a tasty farm-to-table dinner with views of the surrounding mountain peaks. Early morning meditations and all-night chakra spinning musical performances -- it's an all-out ecstatic celebration in the most awe-inspiring locations in the world. So what's a day like at Wanderlust? Wake up to crisp mountain air and morning sunshine in your mountainside condo, throw a couple of items in your daypack, and join dozens of fellow attendees for one of Wanderlust's signature morning meditation hikes. If you have kids with you, no problem -- drop your children off at the Wanderkind kids' program before you head out. 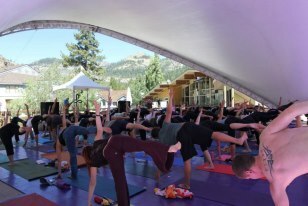 After your hike, cruise for some handcrafted goodness in the vendor village, grab a quick snack from one of our local & organic food vendors, and then hop into yoga class with one of your favorite teachers in a stunning outdoor classroom. After class, reward yourself with a delicious meal from one of our on-site restaurants. Have a seat in our outdoor food co-op, grab a cup of tea in our tea house, and stroll over to our Speakeasy venue, where you can listen to a fascinating lecture by one of our many speakers. In the afternoon, you might check out some of the live music at our Casbah stage, rock an afternoon yoga class, go kayaking down the local river, hit the trails with your mountain bike, or ride the free cable car up to the top of the mountain to kick it poolside with your crew. From an environmental perspective, Wanderlust, in conjunction with our greening partner, Sierra Nevada Brewing Co., aims to lead the way among music festivals. With a focus on local sourcing, organics, reusability, carbon offsets, and sustainability, Wanderlust will be close to a "zero impact" event in year one. Some additional information on our environmental initiatives is set forth below. Wanderlust has set up a streamlined program to process landfill trash, recycling, and biodegradable (compostable) materials, such as food, paper products, and bio-plastics, at our festival. This system typically reduces trash to the landfill by 80% to 90%. Wanderlust will provide waste stations for festivalgoers and supply staff to be present at the waste stations to explain their proper usage and function. Wanderlust will also arrange for separate dumpsters and hauling for recycling, compost and trash. Wanderlust has committed to an unparalleled sustainable food and beverage program. On the food side, we are sourcing food from local vendors wherever possible, to the point where we are setting up a farmer's market on-site. Where local food is not available, weâ're purchasing only organic, sustainably farmed foods. Equally important, the products (primarily utensils, cups, plates and other food-service ware) that Wanderlust uses are all sustainable. Products made of Styrofoam and non-recyclable plastics (such as white picnic cutlery) have been banned at the event to avoid contamination and reach our 90% zero-waste goal. We are providing water filling stations throughout the festival, and where we sell bottled water, the bottles will be made from compostable organic corn-based plastic and the water therein will be sourced in California. Our commitment is shared not just by producers and organizers, but also by our vendors, who will also participate in our environmental program. Wanderlust's site, Squaw Valley USA, is extremely progressive from an environmental perspective. Squaw's chairlifts are electric, eliminating diesel emissions, and its High Camp facility uses recycled waste heat from the air conditioning system to heat the swimming pool. While we currently expect to be able to operate Wanderlust without the use of diesel generators. If generators become necessary, we will source B20 biodiesel in the Lake Tahoe area. We also plan to offer B20 biodiesel refueling on-site for all artist tour buses. Wanderlust will partner with a nationally-recognized company to offset all emissions generated at the event. To support this, we are offering ticketholders the option of contributing $5 to carbon offsets when purchasing their tickets. 100% of this revenue will be paid to our carbon offset partner. 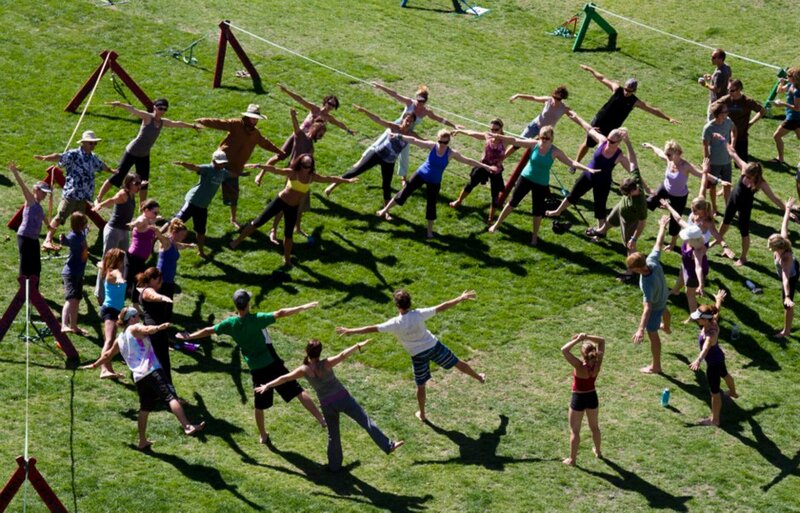 Wanderlust will train at least fifty volunteers to be part of a on-site "Green Team. " The Green Team will be stationed at waste reclamation stations to explain the proper separation and disposal of compostable materials, recyclables, and waste. We also will operate an information booth detailing the festival's environmental commitments.